With over 40 Franconian breweries in attendance, and spanning five rainy days and nights in the Nürnberger Burg, the 2013 Fränkisches Bierfest took place in late May / early June, giving locals and travelers a wide and thourough selection of fresh Franconian beer, all in the heart of Old Town Nürnberg. Full draft pours for two Euros plus the relatively low alcohol level of German lagers (most between 4-5% ABV), allows the fest-goer to consume full samples of fresh lager, many of them poured personally by the brewer. 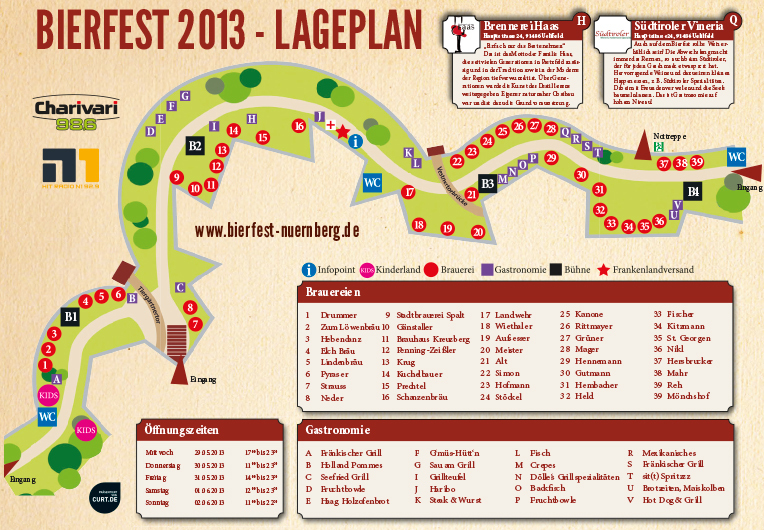 Personal favorites include Lindenbräu Gräfenberg, Rittmayer Hallerndorf, Krug-Bräu Breitenlesau, Simon and, of course, Gänstaller-Bräu. Gänstaller was pouring their prized Kellerbier throughout the festival, and also offered a rotating tap which featured the new Baltic Porter / Dark Bock made with American hops, the Smoked Heller Rauchdoppelbock Romator made with American, Kiwi and German hops, the magical Golden Smoked Zoigl, and the nectary heller bock Ocator as well. Like German hops? Why not try Hersbrucker Bier, from Hersbruck. Or Stadtbrauerei Spalt, from Spalt, of course. Brauerei Simon brought with them their stellar Weißbier, which is actually an ur-weisse (amber weisse), and the festival-only, draft-only Festbier, a toasty and clean Munich malt amber lager with juicy hop expression. Braumeister Andreas Gänstaller (with his wife Manuela) pulling and serving a glass of kellerbier himself. 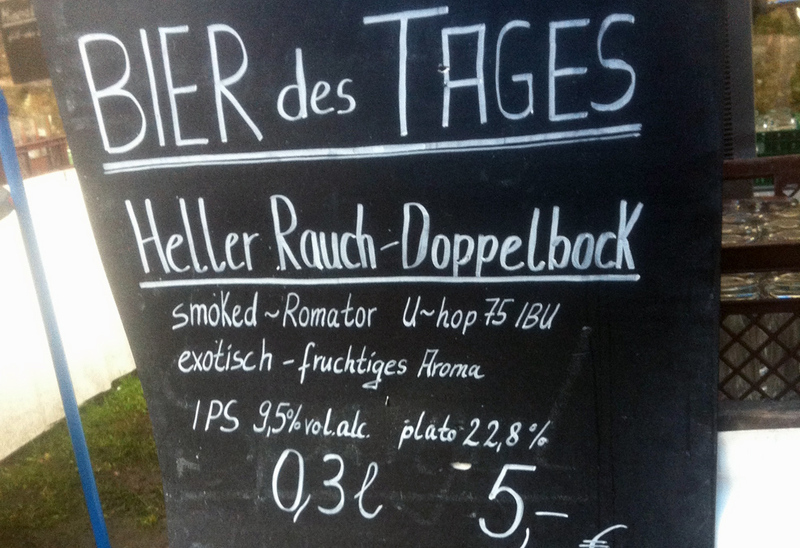 Romator, the newest Gänstaller’s beer, is labeled as a 9.5% Heller Rauch Doppelbock, which to American audiences translates to something like Smoked Double India Pale Lager made with American, New Zealand and German hops. Andy’s Kellerbier: happiness in a glass. draft at Zoiglstube Ganstaller in Strassgiech across multiple visits, and On tap at the Frankisch Bierfest Nurnberg 2013. Hazy pale golden wheat body with a fine white head. Pineapple / banana / tropical fruit hop-focused aroma with malty accents of sweet honey-drizzled pillowy pastries. Yeast is subtly rich and provides good lushness and creaminess (along with the superbly soft carbonation). Sticky pale malt and yeast phenols combine to form a pineapple dandelion and lemon oil bouquet. Sweet but never overbearing. Exceptionally soft, rich and creamy malt texture with a satisfyingly sharp bounce in the finish - crisp, smacking, quenching. Overall a wonderful heller bock that is stacked with complexity. It was a joy to drink this again at the Zoiglstube and then again a week later in Nuremberg - for an entire day. Suits the Kellerbier well for blending. Draft at the Zoiglstube and later at the Fränkisches Bierfest in Nürnberg. Lightly hazed amber with a rocky off-white head. Immensely deep aroma, nearly as stunning as that first smell of Affumicator: red apples, cedar, peppered meat, a little ashy, sweet and fruity, burnt candied apples or something. Chewy, sweet toffee malts and cherry and plum flavored malt sugars. Clean fermentation. Creamy carbonation. Ebbing and flowing and swelling aroma. So it was in fantastic shape from one keg, and from another at the bierfest it was crunchy, sourish and acidic. Damn shame if anyone got a first impression of this beer from that one keg. This is a beauty when it’s in good shape. Draft at the Zoiglstube and again at Fränkisches Bierfest in Nürnberg. First go: Lightly fruity, somewhat musty, green, raw hop aroma. Cocoa / chocolate. Rich mouthfeel, explosive carbonation and bitterness and hop acids in the finish. Very fragrant but also more muddled / yeasty than the keg pours a week later. Second go: Amazingly fruity / grapefruit American hop nose. Rich cocoa and chocolate malt and roast, a lot of enticing dark caramel malt sugars. Cleanly fermented. Roast is earthy bitter baking chocolate. Dangerously drinkable alcohol. Glorious. Something like a strong Black IPA crossed with a doppelbock, and more American in character than German. 12oz bottle at Andy’s brewery, August 2014. Approximately 18 months old. Short tan colored head on a dark chestnut brown body. 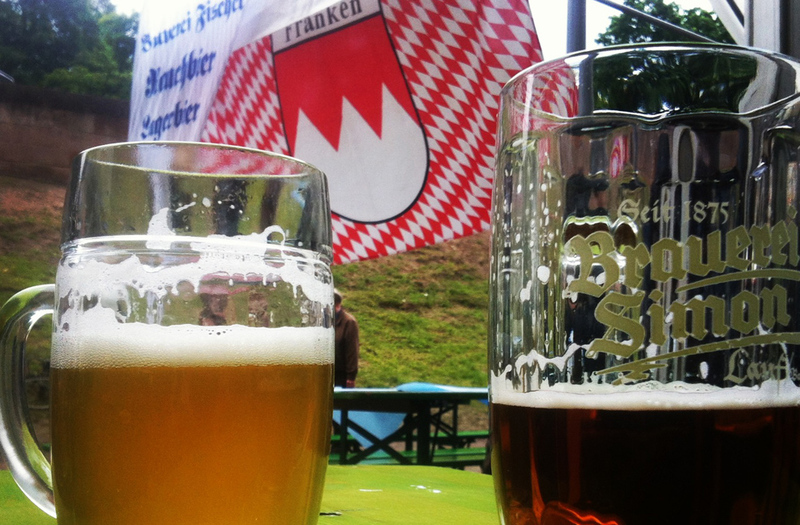 Draft at Fränkisches Bierfest in Nürnberg. Beautiful sea foam off-white head atop a gorgeously hazy chestnut-colored body. Cookie-ish malty aroma of baked bread, spiced apples, cinnamon, toast, caramel. Hoppy and juicy in a mandarin orange / maraschino cherry way. Rich, sweet malt showing great firmness throughout. Wonderfully expressive with no noticeable brewing flaws. Very juicy, very soft and very luscious. Fantastic-looking pour. A favorite from the fest. Yeastier than most dunkles kellerbier, but the flavor and aroma are so vibrant and expressive, and the malt texture is ridiculously soft. In the kellerbier you could see they were close, and I was probably harsher in my rating there than I should be, given the noticeable difference between kegs one day versus the next. So, the helles Kellerbier was *almost* in that high-3-to-low-4 range, if only the laundry soap and starchy malt was taken care of. The Stöffla is proof they are capable of amazing beer. Draft at Fränkisches Bierfest in Nürnberg, after having a yeasty sample from the lagering vessel a week and a half before. In the morning the keg was muddy and hazy so there wasn’t much to get out of it other than raw American hop tropical fruit / bubble gum and an earthy / muddy yeast character. Alcohol is never apparent, not in the nose, flavor, finish or burps, but I think the keg tapped today was probably around 8-8.5% with some time before the beer reaches 9.5%. Later in the day the keg was settled and Romator was pouring clearer, similar in appearance to the Kellerbier that had been pouring each day. Has a TON of citra / high-alpha grapefruit / tropical fruit / bubble gum hop notes on top of a subtle smoked ham / pig back fat rauch malt savoriness. Centennial hops give it a tea and pine character. Citra gives it a lot of tropical fruit bubble gum. Simcoe, I think is in there, from the slight green onion / shallot twang. And the last American hop I think is Columbus, is herbal, fruity, floral and very acidic. Creamy, low carbonation, sweet, full mouthfeel, bitter, Double IPA-ish rauch heller bock something. So a little bit like back bacon and pineapple pizza. I am not a fan of Citra hops at all, they are disgustingly bubble gummy and estery and fake-smelling, but in this beer they work because the master has a touch, and even an absurd-for-Germany smoked India Pale Lager is done probably the best that anyone could do. And yet this is the only one. So that says something too about Andreas Gaenstaller. He’s only the greatest brewer of his generation. Rich, deep gold body with a fine-bubbled white head. Toast / biscuits / baked bread richness of malt. Medium-full body, crisp, rich, minerallic. Superbly clean pale malt sweetness, one of the best pure malt characters of any beer tried at the festival. Nearly heller bock-like in character, so it’s a joy to have that sort of richness without the higher alcohol and sweetness. Given the character I would guess this is the kellerbier filtered. Very clean pilsner malt expression. Aromatic crackers, just-baked bread. Medium sweet, mild -to-medium bitterness. Lingering spiced lemon / floral hop flavors. Striking amber-orange, creamy white head. 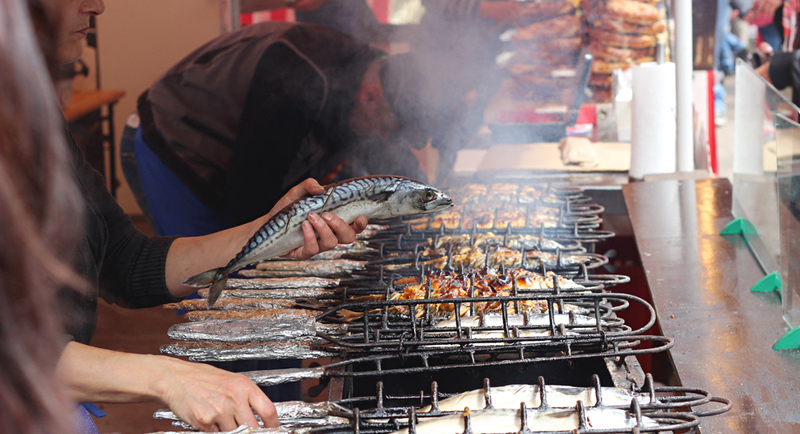 Clean and juicy, smacking, satisfying. Toasty grains with toffee-ish Munich malt touches. Well lagered, no off-notes, malt sugar and oily, fruity hops sit in balance. Easy to put down. Very aromatic and expressive and clean. Surprisingly hazy for a hell, seemingly naturtrüb which would put this one in with zwickelbier, though I no clue if they filter the bottles. Bright, vibrant splat hop nose of lemon and pepper with a satisfying and rich hay / cracker / grain cleanliness. Looks, smells and tastes like zwickelpils; substantially hoppier than you expect from helles, but this is Franconia so calling something a hell does not imply an intended fit to the Munich Helles style. Juicy lemon citrus, creamy carbonation, quenching acidity, mostly dry soft malt body. I could say the nose is a bit quiet at first, but with cold beer in a cold mug there’s not much to get. With the glass heated under a warm water faucet, the aroma becomes much more expressive, the juicy hops jump to life and there’s no hint of any off-notes. With German beer much of the time a crapshoot it is nice to find these beers in good shape at a festival. The Zwickelbier in the bottle last year was disappointing, and the dunkel served along side the Hell was in poor shape. Deep brown body with a soft tan-colored head. Toasty dark malt aroma, sits a level just below "burnt". Clean fermentation; abundant minerals / calcium carbonate. Noticeable flint / phosphorus / match stick smell. Filling, juicy and rich mouthfeel. Off-dry, medium-low bitterness, medium acid, solid malt texture. Lighter touches of dried plum, fig and apricot. Brilliantly clear gold and effervescent body. Tall white head. Strong herbal/ lemon splat hop nose. Soft malt, quenching acid, clean of flaws. Fruity, floral, lemon oil finish. Wonderfully balanced and without any perceivable problems. Only suffers from it’s one-dimensionality. 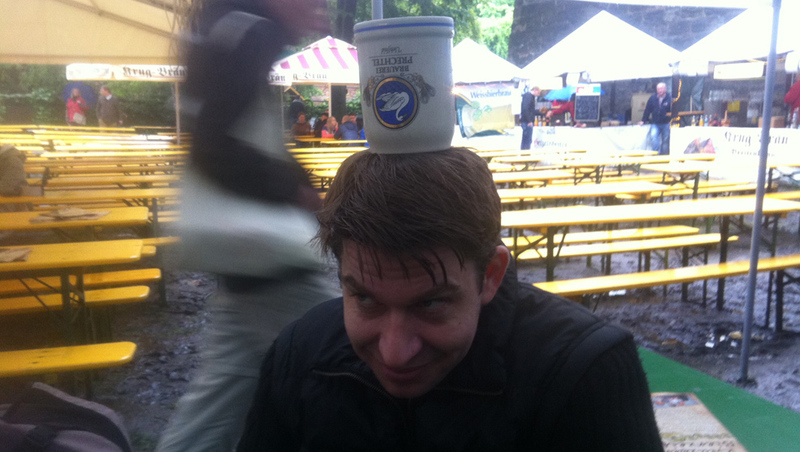 Draft at Fränkisches Bierfest in Nürnberg as Homann naturtrüb Helles. Hazy light gold body with a fine white head. Quiet pilsner malt aroma of honeycomb, crackers, light grains. Yeast brings it a strange marshmallow fluff airiness. Very mild DMS of cooked carrot and sweet corn. Vibrant hop acids, lots of lemon and orange citrus zestiness. Soft body, creamy carbonation, appropriate lagering crispness. Suffers from it’s plainness and the mild DMS notes. Enjoyably dry, effervescent and restrained. Hazed pale gold body with a short white head. Vibrant Cascade tropical fruit juiciness with some Amarillo/Citra-like flower petals and shallot early in the aroma, turning slightly more pine-heavy as it opens. A faint whiff of cheese rind and cat pee are in there as well, though the cat pee might be from old hops. Malt is obscured by the strong aroma hops, and what is there seems toasty, bready and with some yeast vitamin / chalk quality, some doughiness. Medium bitterness is tuned to match the body of this beer rather than the hop aroma, which I appreciate. Thankfully not overly bitter for the sweetness level and body. Toasty, nutty, bready and clean. Crunchy and toasty malt flavor early. Develops juicy / fruity hop bouquet late. Medium body, crisp, medium carbonation. Suffers from simplicity but seems fairly well-made. Hazy gold, tall white head. Noticeable calcium / mineral character. Enjoyable hop aroma: floral lemon, dandelions, mild cheese rind. Juicy hops, soft malt and carbonation, zesty hop acid bitterness over honey-sweet malt. Some wateriness in the finish, but otherwise it’s solid. Hazy rich yellow body, fine white head. Lemon pith / juice hop character to the nose. Some dish soap esters (okay) and laundry detergent (not okay). Floral, tart lemon and pils malt flavor. Waxy / oily at times; yeasty and dirty. Finish of sharp lemon-scented laundry soap finish. Second try a day or two later still had some of the same off-notes but they weren’t as bullish. Ur-weisse rather than dunkelweisse. Simply called Weissbier by Simon. First tried from a bottle best by November 2013. Mealy apple and browned banana aroma. Soupy wheat / grain flavor and mouthfeel. Again on draft at Fränkisches Bierfest in Nürnberg. Little more life to this one. Clove and banana are nice. Amber malt / wheat bread crust character has some bounce. Still a little too yeasty. Masking. Mostly clean pale malt aroma with light apple / pear esters. Grassy, lightly hoppy with mild lemon and pepper. Clean flavor, quenching acid, light body, lightly bitter and semi-sweet with excellent malt firmness. Hazy rich orange-brown body. Cascading slow-crawling head. Patchy and foamy white head. Diacetyl, orange jelly, peanut butter notes, some yeast. Brown sugar, browned bananas and apples. Unpleasant to smell and taste.
. Medium-full body; rich carbonation; moderate bitterness. Something like a classic kellerbier with problems: sweet, raw, diacetyl-laden. Good body, fruity hop character, but sourish malt and diacetyl kill it. Turns more towards tangy orange jelly / spoiled fruit as it warms. Clear dark brown. Simple cookie / cracker / bread aroma with some notes of old fruit cocktail and orange jelly. Sweet, medium body, low bitterness, low acid, watery finish. Simple, sweet amber malt extract syrup flavor and texture. Dull. I went for a full glass after having a bit the day before and thinking it had potential. Sadly this beer plays a different song when it is warmed. Brilliant copper body, cascading, frothy, slow-crawling carbonation. Raw cereals in the nose. Cosmetics, rose pedals, apple, make up powder, fusel alcohols. Cereal, toffee, orange jelly Munich malt. Sweet and sour flavor with candle wax and orange flavored makeup. Peanut nuttiness and more fusels in a watery finish. Dull copper body with a fine off-white head. Starchy malt, powdery yeast, lightly minerallic. Lots of red apple skin, sesame seed and breads. Low hoppiness, lightly sweet, flabby and thin. Doughy, soggy saltine cracker flavor. A little tart and a little limp. No life. Metallic / tinny aroma.<be> Quiet amber malt / toasted crackers. Dried oranges. Rough and husky. DMS / cabbage / carrot aroma. Some cigarette filters and ashtray notes. Mushy pile of cooked corn on a plate. Medium-light body, sweet, medium bitterness, chalky and dirty. A lot of soil / iron / earthy off-notes. Lemon and cement mix and shattered cinder blocks. Cooked corn, candy corn, grain husks, all in one whiff. Fizzy, rough, dry, massively starchy and husky. Damnit. Dirty metallic apples in an estery aroma. Soil, acidic fruit cocktail, fusel alcohol. Clear rich gold body, short white head. Cigarette filter and diacetyl and solvent in the aroma. Touches of cement mix / cinder block. Hoppy, bitter, starchy, dirty and stale. Saltine crackers, cat pee, hair, donkey, corn kernels, etc.